Jolly Good Productions present their Christmas Puppet Show at the Town Hall, Richmond ( North Yorks ) on Christmas Eve at 2pm. The show lasts for approximately sixty minutes and is ideal for children ages four to eight years old but children of all ages are welcome. Children must be accompanied by an adult. The show is a mix of clowning, puppets and storytelling with lots of audience participation. 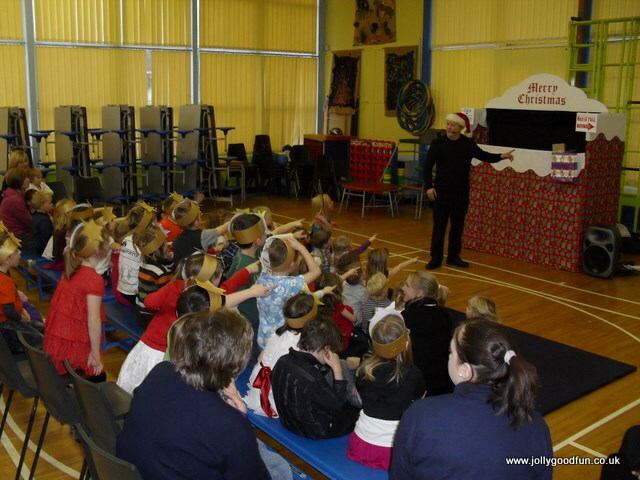 Younger children will love the Christmas characters and joining in with all the fun. There will be a collection afterwards for the Mayor’s charity. Book this show for your next Christmas party. Book early for next year. Tel 01748 821621 for a FREE quote. This entry was posted in Christmas Entertainment and tagged Christmas, Christmas Entertainment, Christmas Party, Christmas Puppet show on December 19, 2011 by ronwooduk.